Spider-man has been many things over the last 5 decades. The two most common adjectives used to describe him have been 'amazing' and 'spectacular', but only Mary Jane knows for sure. So it's probably no surprise that when naming the new cartoon due to hit airwaves in early March, that the WB execs went with 'spectacular' once again. 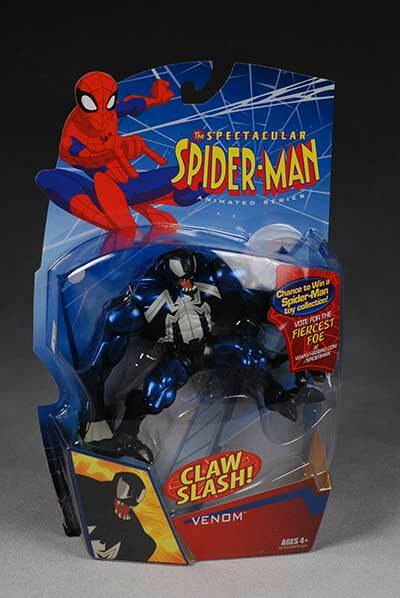 The Spectacular Spider-man is scheduled for March 8th, but the toys are already hitting shelves. I picked up a regular Spidey, Venom and Doctor Octopus for the review tonight, and there's also a Spidey with removable mask, and Symbiote Spidey in this first series. I snagged these at Target, where they are running $10 a pop. You should be able to find them at other retailers like Toys R Us and Meijers any moment now. The package design doesn't do a lot to set itself apart from the rest of the Spidey toys on the peg, of which there are still plenty. While the graphics are done in the more animated style, the red and blue tends to camouflage them amongst the movie toys. Hasbro gets props though for putting them out in *almost* collector friendly bubble packaging. We first saw this with the Marvel Toys Legendary Comic Book Heroes line, where by simply cutting some tape around the bottom of the package, you could remove the interior tray without damaging the cardback or bubble. Hasbro has some something similar here, but used one corner instead of the entire bottom section. You'll have to be very careful to pull it off successfully, but these can be removed and replaced if you want it bad enough. The Spider-man is easily my favorite sculpt of the three. The style might not be to everyone's taste however, particularly with the oversized head. I like the angular sharp lines, and the scale is 6", rather than the obnoxious 5" movie scale. Peter, behing a junior high kid in this show, stands 5 1/2" tall. Yea, he's big for his age. He's also taller than the other two, although they are both crouched. 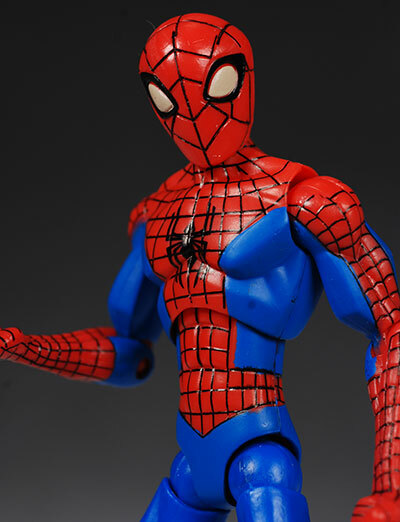 The webbing lines on his suit are all sculpted in, and there's no texturing to the blue areas. The body proportions fit the style of the show, with a large head, hands and feet and thin sharply muscled body, but I think it's an interesting look that works fine. My biggest sculpt issue with Spidey is his hands. The right hand is in the traditional web pose of course, but his left is in a gripping pose, very much like a gun hand. Both hands are sculpted palm up, and there's no way to turn them. No bicep cut, no wrist joint, zippo. While that leaves one good pose for the left hand - "ptthbbtt" - it leaves really nothing for the right. Perhaps that hand is supposed to look like he's got that web hand loaded, cocked and just about ready to fire...but it ends up looking dopey in just about every pose. 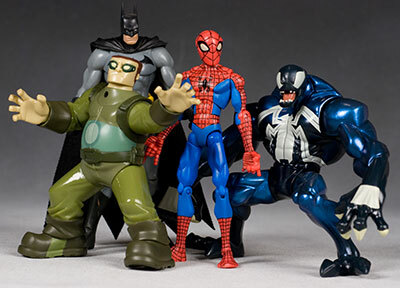 When checking out Venom and Doc Ock, the first question that came to mind is "what happened to the head sculpts?". The character designs for these two have clearly changed - radically. In the case of Venom, that's not a good thing. The head sculpt on the back of the package looks terrific - the one on the figure looks like a smooshed beetle. There's something about the jutting lower jaw, narrow head and nubby teeth that takes all the bite out of his appearance. 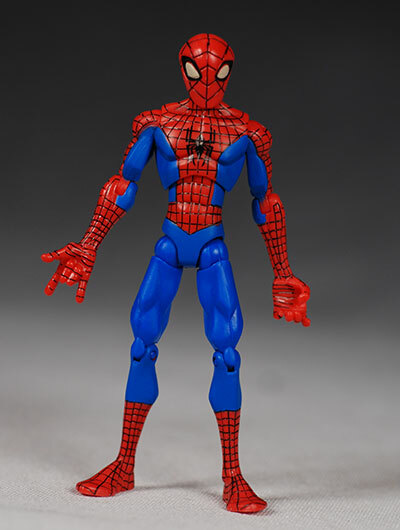 He has the reverse head/body proportions from Spidey, with a tiny head on a huge, heavily muscled body. He's sculpted into a deep crouching stance, but surprisingly enough, he stands fine on his own. It's in one stance only, but the huge feet keep him quite stable. 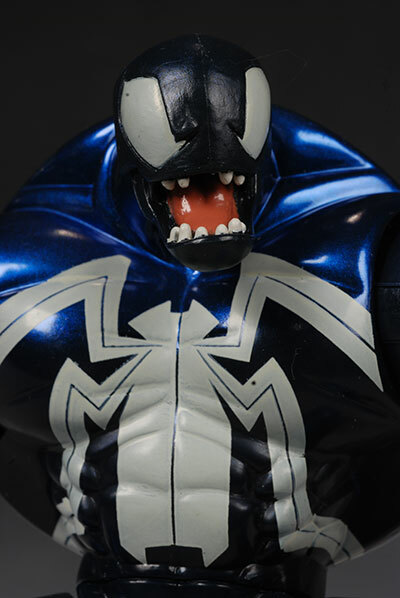 The technical execution of Venom's sculpt is fine, but the design of that goofy head just ruins the figure for me. 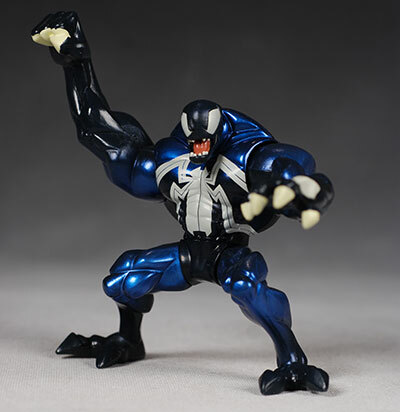 Venom, in his deep crouch, stands about 5" tall. 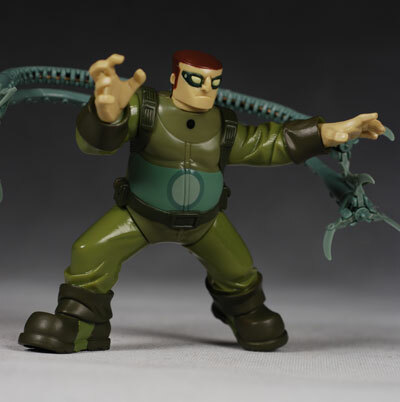 Doc Ock actually gets better points because of the design change. On the back of the package, the head sculpt looks like it belongs in an animated version of an Old Navy commercial, with tussled hair and upper middle class good looks. But the final head sculpt has a very sharp definition, with a smooth hair cut and hard lines around the jaw and nose. It's still not a terrific look for Ock, but it's certainly better than the original design. My problems with Ock are less around the head and more around the body. He has less articulation than the others, so you're pretty much stuck with the sculpted stance. The wide stance with the huge feet have him almost in Rescue Hero land. He's not quite there, but he's bought a ticket for the bus. But if those were the only problems, I would have given this guy another half star in the category. Nope, I had one more major issue that pulled him down. His tentacles have a pretty interesting action feature that involves little cables inside each arm, designed to close the pincers. However, the arms aren't bendy, or articulated, which means that you're pretty much stuck with the sculpted pose unless you resort to the hot water/cold water treatment. The tentacles come out of the package flat against each other in a truly uninteresting pose. 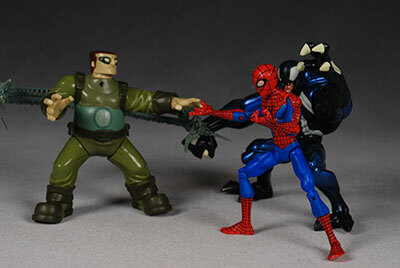 And Doc Ock is also crouched, coming in at about 5" tall. His crouch isn't nearly as deep as Venom's though, and he's really more in a 5" scale - or a really, really short man. With Peter supposedly in Junior High School, and still as tall or taller than this guy, he's pretty short. The paint work on all three of these is mass market expected. There isn't too much slop, but the number of ops are fairly minimal, there's plastic molded in the color where possible (like the blue on Spider-man's costume), and bright solid colors are the predominate feature. Spider-man's web lines are fairly well done, with only a little slop here and there or the occasionally missed section. The eyes aren't bright white, with a bit of a greenish tinge to them, and the red spider on his back is a bit more Egyptian beetle than mutated spider, but it's done cleanly. Venom has a very clean paint application, with each of the ops done fairly precise. The white is particularly impressive, with clean symbols on the back and front, as well as nicely done eyes and claws. My biggest issue with Venom is one of style, not execution. You may not have this same issue, since it depends more on taste, but I'm not feeling the bright metallic blue highlighting. Calling it highlighting is even a bit of a misnomer, since there's so much of it. And it's so metallic. He looks like a 1982 Special Edition Firebird I once owned. I loved that color on my car. Not so much on my super villain. But Ock gets the worst paint score. As I mentioned earlier, some of the colors are molded plastic, but on the other two it's not as obvious an issue. With Ock, his green suit (the majority of his outfit) is molded green, with that shiny finish that you always end up with when you skip the paint. His face and hands are molded in flesh, his tentacles are molded in gray...all of this gives him a much cheaper appearance. If you're expecting Marvel Legends levels of articulation, you'll be disappointed. These have more than the basic five points, but there are some important omissions. Spidey has a neck joint that might be a ball joint up under that big head, but works like a cut joint. There's no tilting or forward/backward movement here. He has ball jointed shoudlers, but they are only jointed on the torso side, so the arm itself can turn relative to the ball. The hips are true ball joints with joints on both sides of the ball, thank goodness. The elbows and knees are single pin joints, and there's the familar 'rocker' pin joint at the chest. It rocks about as much as your Grandma though, and works more like a cut joint. He does hold poses well though, and the joints are tight but fluid. The huge omissions are the cut wrists and cut biceps (or adding the joint on the other side of the ball shoulder). Without these, the hand arm positions are much more limited. I found myself quite frustrated when I was posing him for photos. Cuts at the top of the boots would have been a nice to have, but not a necessity. 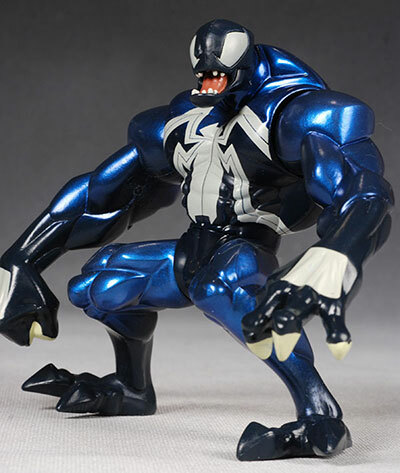 Venom has the cut neck, ball jointed shoulders (again, only jointed at the torso), cut hips and cut waist. The waist joint is actually used for his action feature, so it doesn't really function as a point of articulation i.e. you can't use it to pose him. Poor Doc Ock ends up last place again. He has a cut neck, but only cut shoulders this time. He also has but hips, but the left hip is used for his action feature, and like Venom's waist, can't be used to pose him. Oddly enough, he has cut wrists. They help him a little, but with the arms sculpted in extreme poses and only cut shoulders to move them, it's not like the cut wrists were going to make a huge difference here. The saving grace for Doc Ock is the articulated pincers on the ends of this tentacles. The top two work with the action feature, but the bottom two merely move when you press in on the center. You can press them against a victim and they'll move around him. Since you can't actually pose the tentacles, this is a lot less cool than it sounds. For a kids series, this line is sorely lacking in accessories. 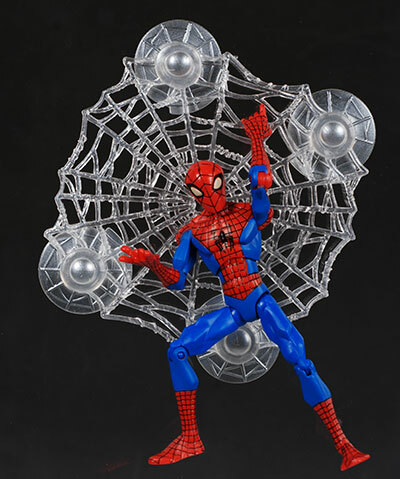 Spider-man comes with a rubbery hunk of webbing that can be attached to the wall with suction cups, and he can hang from it. 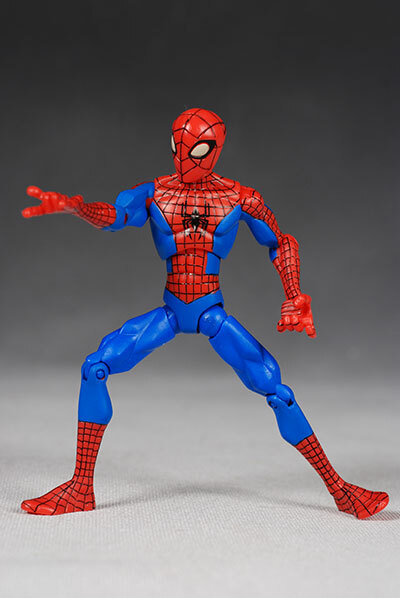 The left hand does work in this way, but not great, and it could have been sculpted in ways that would have better facilitated posing him on the webbing. Venom gets zippo. Yep, the poor guy doesn't get a damn thing. 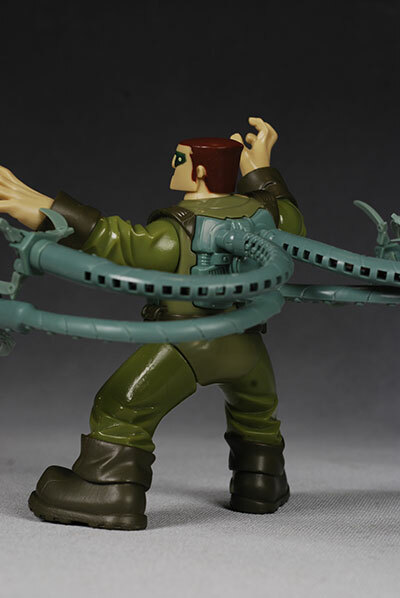 Doc Ock has his tentacle backpack, which once attached isn't really supposed to be removed, so it isn't much of an 'accessory'. 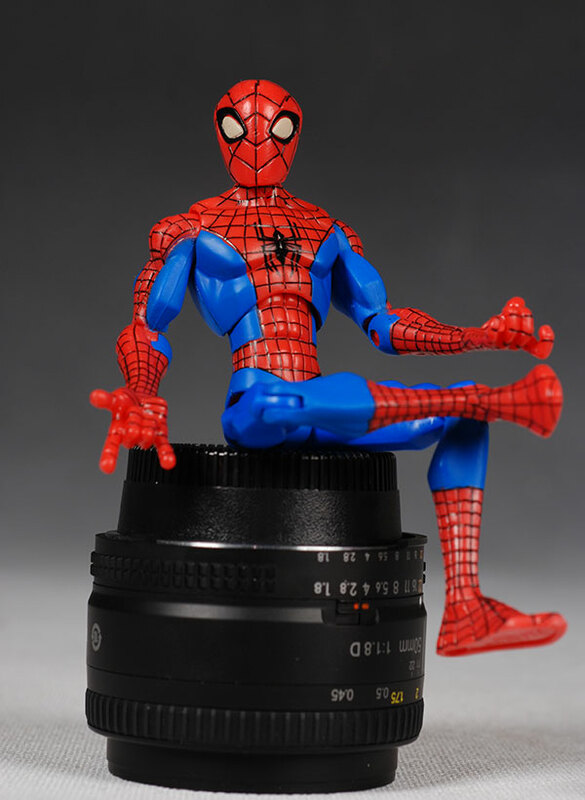 Spidey's suction cup hunk of webbing probably counts as his 'action feature', which thankfully means he has no other gimmicks to gunk up his sculpt or articulation. This is one of those unique categories where getting a bupkis isn't such a bad thing. This is a kid's line though, so I'm not surprised Hasbro found the need to add action features. Venom has the old reliable 'twist and punch'. He has a spring in his waist so that when you turn his torso, it snaps back to center, delivering a deadly blow to any opponent. The nice thing about this action feature is that it doesn't interfere with the sculpt, only minimally hurts the articulation, and actually works pretty well. 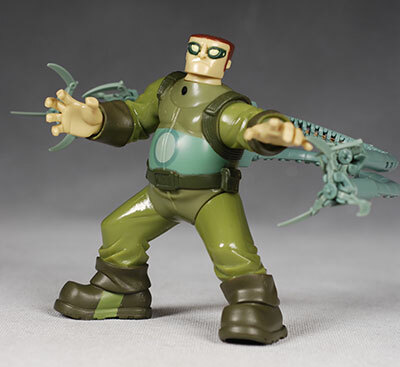 Hasbro actually got pretty creative with Doc Ock. Once the back pack is attached, you can press his left leg inward, and the pincers on the two top tentacles will grasp inward. This is accomplished with some small 'cables' that run inside the tentacles. It's a pretty nifty idea, but like most of these nifty ideas, it looks better on paper than in reality. Get it all lined up just right, and the pincers move a little, but don't expect Spider-man to crap his shorts when he sees it. Kids would have had more fun with bendy tentacles without the action feature. The figures are actually pretty fun for kids, with reasonably unobtrusive yet enjoyable action features. The articulation could be better, and the collector may find some of the colors/designs annoying, but kids would have fun battling it out between the young Spidey and the young Venom. I'm assuming he's young, of course. Ten bucks? Ouch. With kid related movie lines for Star Wars, Star Trek, Prince Caspian and others coming out in the 3 3/4" size and $7 price range, Hasbro is going to have a tough time convincing Mom that these guys are worth the extra $3. Not much. Expect mass market quality - massmarkuality - and you won't be disappointed. While Spidey is clearly a better figure in many ways than the other two, they all fail with limited accessories and a high price point. Had these been around $7 - $8, another half star might have been possible. But even then, Ock wouldn't have been saveable. He just has too many issues, from the cheap looking molded plastic to the wonky articulation and small scale. 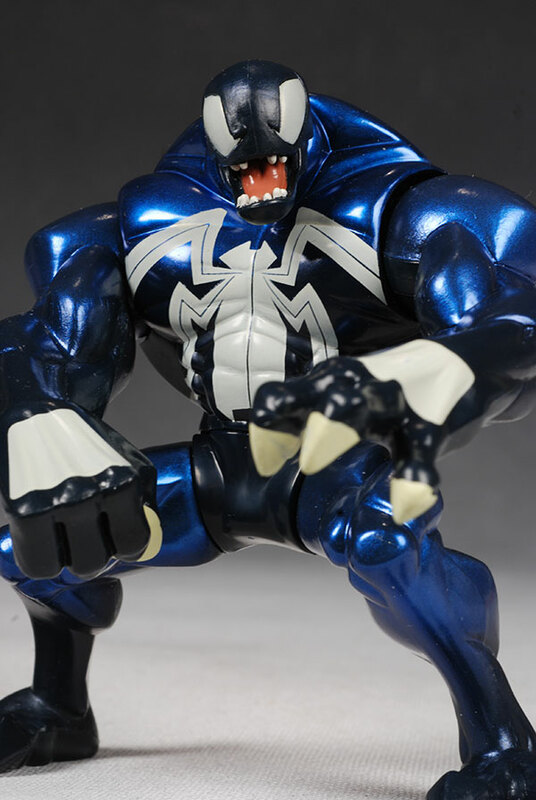 Venom had potential, and had we gotten the nasty looking head sculpt on the back of the package, he would have scored much better. 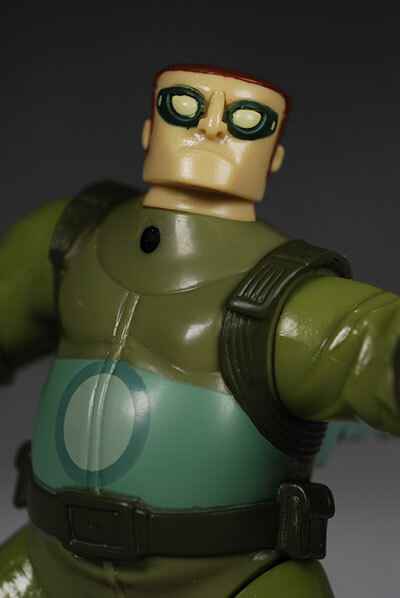 Instead they gave us this Fischer-Price version of the head sculpt, sucking the venom right out of him. Spidey scored the best, but even then is just barely above average. This isn't going to be a series that wows anyone. Hit the big retailers for these, including Target and Toys R Us. Target seems to be getting them first, but I bet the others aren't too far behind. I have more Spider-man based reviews than you can shake a tentacle at. Head over to the Search Reviews page to find them all.